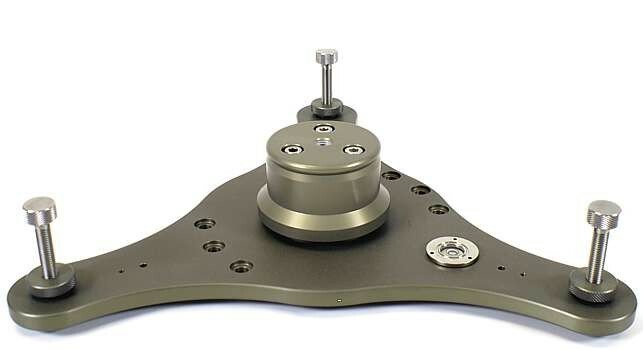 The Hi Hat allows low positioning of the camera. 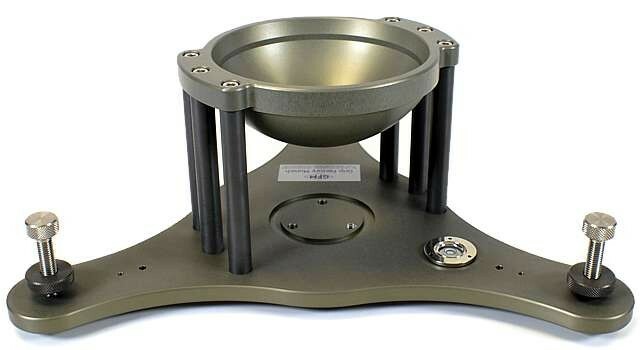 It's available with 100 / 150 mm bowls, Mitchell plate or a Euro-adapter. 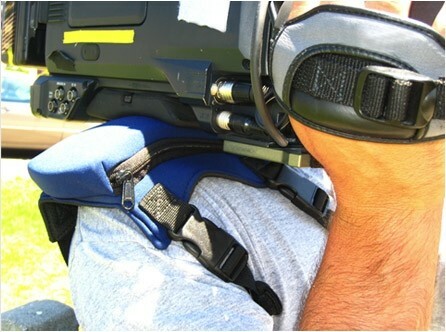 The Camera Comfort Cushion is a shoulder pad designed for camera operators to help prevent shoulder pain and discomfort associated with continuous shooting. 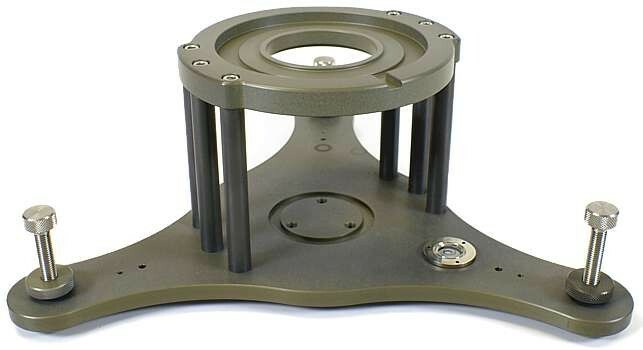 Our cushion is designed to give maximum flexibility suited to the camera operator and his or her equipment. 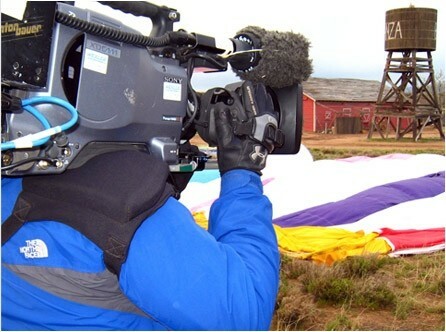 The cushion works with a variety of camera sizes from shoulder mounted MiniDV cameras, to broadcast sized cameras and motion picture film cameras. Please check out our photo gallery and our help section if you have any questions. 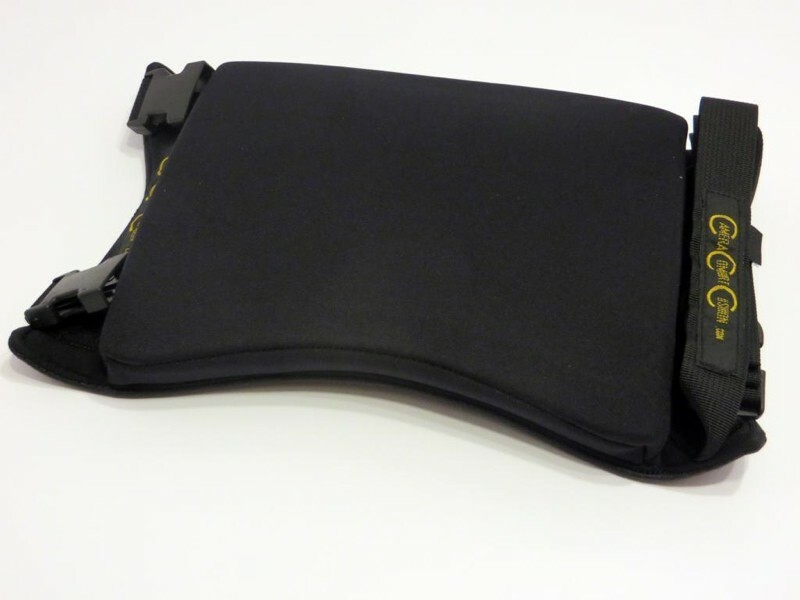 The Camera Comfort Cushion is made with a 2mm Neoprene top. The bottom is made with a non slip neoprene mesh, which clings to the shoulder, allowing minimal movement of the comfort cushion. 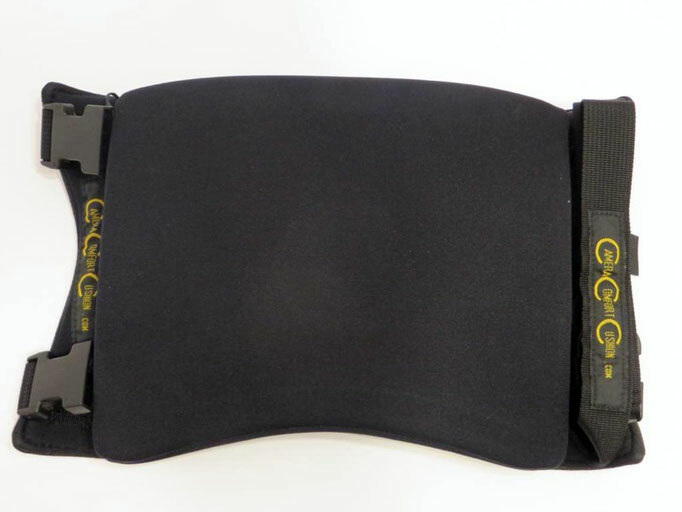 Depending on personal comfort, each Cushion comes with a variety of inserts, which fit inside a zipper pocket. They range in thickness and density and can be arranged to the Operator’s preference. After several uses, the inserts mold to the operators shoulder making it a perfect fit. 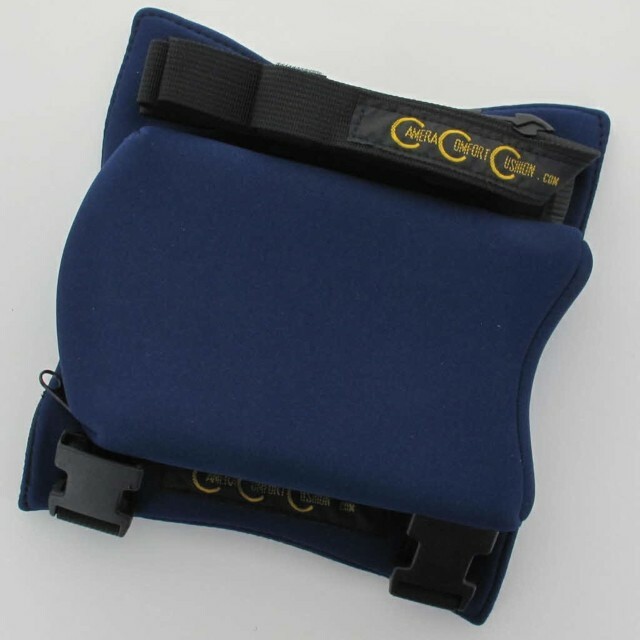 The Comfort Cushion is designed to hold up to 1 1/2'' of padding. 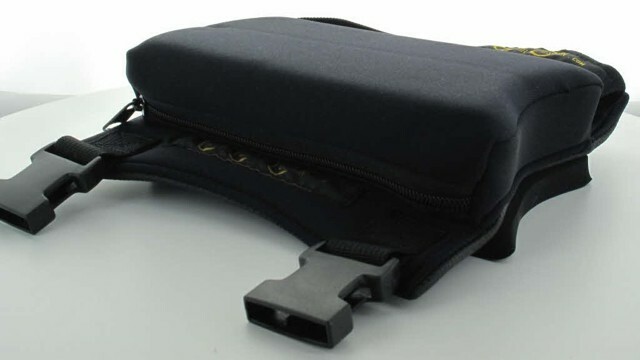 The Camera Comfort Cushion has two adjustable nylon straps with buckles that keep it in place. One strap wraps underneath the right arm to a side release buckle, while the other strap wraps around the chest. The Camera Comfort Cushion is 7 1/2 '' long by 7 1/2” wide. The pad pocket is 7 1/2” long by 4 1/2” wide. There is a 7'' zipper attached to the front to easily insert the foam pads. The XL Pad comes with 3/4 Inch Rubber Pad and 1/16" Plastic Insert. No other pads are available for the XL Pad. Features Not a totally new concept. 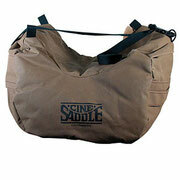 Many years ago we used sandbags. New the design and material - both offer advantages in day to day use. 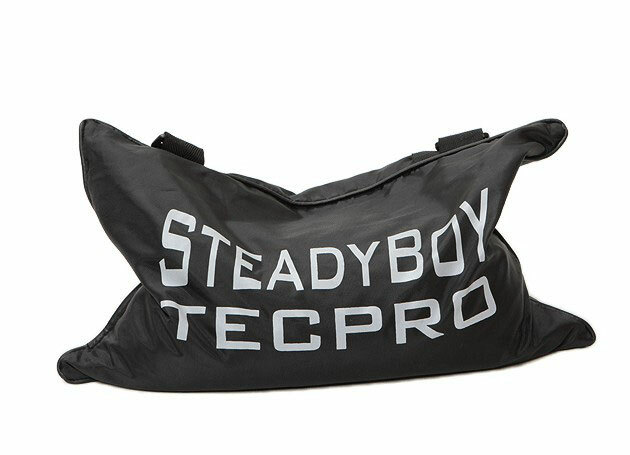 SteadyBoy and SteadyBaby are double wall bags from water resistant material filled with thousands of Polypropylene pellets. 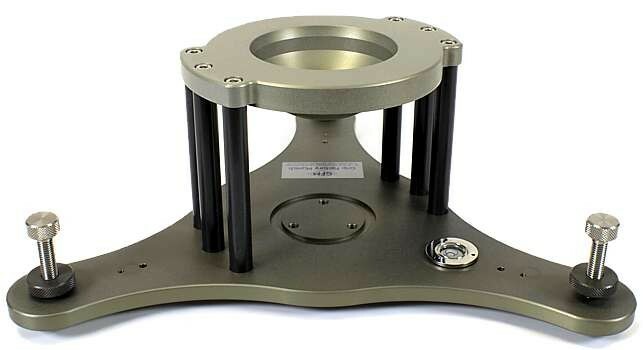 If you don´t want to carry a suitable tripod and still need super steady images, even in locations where you could not use a tripod this is the ideal tool. Shooting on rocks, the roof of a car, the railing of a ship, a rooftop. Sharp shooters use similar concepts/the same technology. Shooting a documentary with a small team in rough terrain, even when a long lens is needed, and especially when it is a little windy, when a lightweight tripod would become useless. Every experienced documentary shooter can add dozens more examples. If you want to maximize the setups you can fit into a tight schedule, get Cinekinetic's most popular product, the Cinesaddle. Many cinematographers use the Cinesaddle primarily as a replacement for their tripod but it may also be used to attach your camera to any static or moving object. 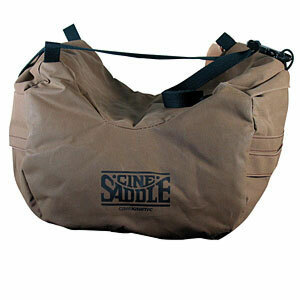 The Cinesaddle is measured in ounces but it will support all professional cameras. The way the Cinesaddle works is basic. Hi tech foam balls push the sides of the bag tight up against the camera, holding it rock steady. In similar fashion, the bottom of the Cinesaddle molds itself to the shape of the object it is positioned upon, preventing it from slipping High tech beans inside the Cinesaddle absorb vibration, providing a very stable surface for the camera.